F1 Linksheaven has a post at the moment complaining at the number of F1 blogs that contain advertising, particularly the dancing, flashing variety. While I agree that the proliferation of advertising on the net becomes intrusive and distracting, it seems to me that blogs are not the worst culprits. Most of those that I visit confine the advertising to a few Google Adsense ads - perhaps it's all about your chosen neighborhood. The real offenders are the F1 sites, those worthy extensions of the magazines that make a few bucks on the side with their ads. Just take a look at Autosport if you want to see the most intrusive advert ever created. This baby sends youthful merry makers and boxes prancing down the page, obscuring the text and cluttering your vision; you have to wait for them to be sucked back into their alloted space before you can continue reading. Oh, they give you a little "Close" button but it doesn't work. That advert has singlehandedly managed to make me consider dropping Autosport from my daily reads, as happened to F1-Live. With that one, the ads were not the main problem - it was the multi-layered approach to web design, leaving the reader with page after page to click through before reaching the news. And each page has its quota of animations and fancy graphics to slow everything down. On the net, only two things matter: content and speed. The vast majority of readers are there for information and they want it quickly. It helps if the site is easy on the eye but if it's done at the cost of speed in loading, it doesn't matter how pretty your site is, it won't get read. And it doesn't help the advertisers if readers are turned away from the site - all their flashy, prancing animations are just garbage if no-one ever clicks on the stupid things. The news blog that I run, Formula1Sport, does have a few ads of the fancy, mobile variety. A sale of the site is presently being negotiated and this has meant that improvements have not been made in the meantime, but the intention is that this type of advertising will be banished as soon as I can get to it. The majority of the income from the site comes via Adsense anyway, the flashy ads contributing a tiny amount only. It just shows how long it is taking traditional industries to adapt to the new medium of the net. All-singing, all-dancing ads might go down very well on television but on the net they are a complete waste of time and money. Google, as a company rooted and dependent on the net, have shown the way with Adsense, but this is merely a first primitive thought on the matter. In time the cleverest advertisers will come up with new ways to sell things through the net - they just haven't managed it yet. With a little thought and ingenuity, F1 blogs and sites could demonstrate that they are the cutting edge of technology in this field. They have a large and knowledgeable market and plenty of advertisers willing to take advantage of it. The trick will be in coming up with a form of advertising that is relevant to the tastes of the readers, is restrained but noticeable (I think most net users don't even see Adsense anymore), and does not irritate the reader beyond endurance. It's a tricky one but someone will do it, sooner or later. And then, hopefully, we can say goodbye to adverts that take over our computers and thrust themselves in our faces. "That advert has singlehandedly managed to make me consider dropping Autosport from my daily reads"
already have, partly because of the ads, and also because of the bandwidth sucking videos that loop over and over in the corner. playing once is fine, but EVERYTIME i look at the homepage?? for the record, the formula1sport.net advertising does not bug me at all. It's such a shame, really, I enjoy Autosport's articles, especially their in-depth studies, and it was once such a simple, straightforward site. Those ads and videos will kill it. 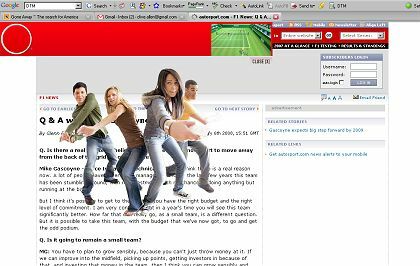 If Flash adverts annoy you (as they do me) then I would highly recommend the Flashblock extension for Firefox. It prevents Flash files from displaying until you explicitly press a play button that shows up in its place. I am not even aware of these annoying adverts any more. It does astonish me that such adverts still exist. The clickthrough rates are very low. Apparently the problem is even spreading to actual site content -- anything that stands out gets ignored by most users who assume that it is an advert, even if it isn't! Surely the advertisers must begin to realize that they get no benefit from such ads. I can only presume that the perpetrators never surf the net themselves and have no idea how they can completely turn off a user. "A sale of the site is presently being negotiated and this has meant that improvements have not been made in the meantime"
would it not be easier / quicker to buy a new domain, and set up an identical concept elsewhere? given that i only started reading the site after you took over... if you said you were starting a fresh news site, i'd simply subscribe to that instead. i am quite fickle though. It's complicated, Sidey. Basically, I've already agreed to write and edit for yet another F1 site and I mentioned to the owner that F1Sport was up for sale. He was interested so I put them in touch with each other and now await the outcome. In the meantime, I keep F1Sport going so that there remains something to sell. I won't deny that the thought of starting a similar site has crossed my mind but I don't really have the time for the technical stuff necessary. It's just easier to let someone else do that while I get on with what I think I do better anyway - certainly, I enjoy it more. Thanks for the compliment, however. While we're on the subject, would you be interested in writing the occasional article for another site? Perhaps technical stuff or political or whatever takes your fancy. Clive dont you write another blog that has nothing to do with F1. Where do you find the time. You must spend every waking hour writing and reading. Anyway the ads do bother me but F1insight ads are not obtrusive(sp?). the ads that move on a loop just irritate me to no end. I've never used F1-Live because the Yahoo! news portal offered all its salient news, along with the salient F1 news of several other sources, at a glance, with little fuss. By the sounds of it, I should continue to not use F1-Live. Autosport isn't in my daily read list, but that's because the interesting stuff tends to get linked by other sources I do read anyway, nothing to do with adverts. Most of the blogs I've seen have no ads once ABP has finished its work and that's just fine by me. I don't think ads can work on the internet as such - it is a wide-ranging, anarchic network of people who have little in common with each other apart from a desire to find and use a certain type of information. The only method that can truly work is word-of-mouth (or word-of-screen) recommendation, which is why the more careful uses of Amazon affiliations are working. The savvier part of the internet community trusts according to personal-level trust, not because of brand names or flashiness of advertising. Interesting thoughts, Alianora. It's certainly true that word-of-mouth is an important factor in deciding the choices of internet users. Amazon affiliations I've not tried, so am not really qualified to judge them, but I have tried other affiliate types of advertising and they are worse than useless. It may well be a matter of matching the right form of advertising to the right clientele. "would you be interested in writing the occasional article for another site?" can do. timing will be a bit sporadic though... there's this other site y'see... kinda takes up a lotta time. That's great, Sidey - sporadic is just what's needed. I'll let you have more details as soon as I know them myself. F1-Live was miy site of choice for a long time and I even subscribed for a year to get some cheap tickets to Spa. In the end though the ads just got too much and I have barely looked at it in the last year. Shame really as I preferred their coverage to that of Autosport. A very similar experience to mine then, Punter. It's a shame when much-loved sites ruin things through obtrusive advertising or over-elaboration of graphics.